Will the global business-friendly environment continue, or will markets feel the pain of fiscal fade and protectionist policies? Josh Kutin, Head of Asset Allocation, North America, outlines the key scenarios. So twice a year, we sit down to do what we call our five-year strategic forecast process. And we try to think about what are the big scenarios that are out there for the world, what are some of the probabilities that those different scenarios might happen, and what's going to happen in each of those scenarios. There's three key scenarios that we focused on for this past exercise. The first one is the global business-friendly environment. And that's really seeing some of the different themes that have played out since the U.S. election in 2016, continuing on. Every time we sat down to do this exercise for the last six months, one year, we felt that this probability continues to come down. Another scenario in the markets right now, we think, is what we call the fiscal fade. The idea that all the different stimulus, which the government has pumped into the market, will continue to fade down and we will start to see more and more economic measures fall off, come down a little bit. And this isn't necessarily going to be great for markets in the long run. The final scenario that is making a lot of headlines lately, is the idea of the trade war, or the protectionist policies. And it really is too soon right now to determine how this is going to play out. But the important idea is that there's a lot of volatility here. We never know exactly what's going to happen when we wake up this morning and see what the President wants to say. And that's really having some meaningful implications for market volatility. Overall, we continue to believe that this could continue to be a bumpy ride for investors. The views expressed are as of December 2018, may change as market or other conditions change and may differ from views expressed by other Columbia Management Investment Advisers, LLC (CMIA) associates or affiliates. Actual investments or investment decisions made by CMIA and its affiliates, whether for its own account or on behalf of clients, may not necessarily reflect the views expressed. This information is not intended to provide investment advice and does not take into consideration individual investor circumstances. Investment decisions should always be made based on an investor's specific financial needs, objectives, goals, time horizon and risk tolerance. Asset classes described may not be suitable for all investors. Past performance does not guarantee future results, and no forecast should be considered a guarantee either. Since economic and market conditions change frequently, there can be no assurance that the trends described here will continue or that any forecasts are accurate. Investment products are not federally or FDIC-insured, deposits or obligations of or guaranteed by any financial institution and involve risks, including possible loss of principal and fluctuation in value. Securities products offered through Columbia Management Investment Distributors, Inc., member FINRA. Advisory services provided by Columbia Management Investment Advisers, LLC. Securities products offered through Columbia Management Investment Distributors, Inc (member FINRA). Advisory services provided by Columbia Management Investment Advisers, LLC. Investment products are not federally or FDIC-insured, are not deposits or obligations of, or guaranteed by any financial institution and involve investment risks including possible loss of principal and fluctuation in value. 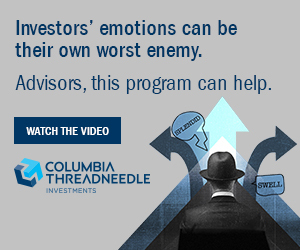 Columbia Threadneedle Investments is not affiliated with Asset TV and has no responsibility for its operations or services. © 2018 Columbia Management Investment Advisers, LLC. All rights reserved.